The wreck in the Sporades in the Northern Aegean will form part of a new archaeological site where divers can explore Greece's underwater antiquities. Pictured above: A diver explores a 5th-century shipwreck off the coast of the islet of Peristera near Alonissos in the northern Sporades, where archaeologists discovered dozens of ancient amphorae. This wreck, along with another three locations in the Pagasetic Gulf, will form Thessaly’s first underwater archaeological site, as part of the EU-backed BlueMed initiative. 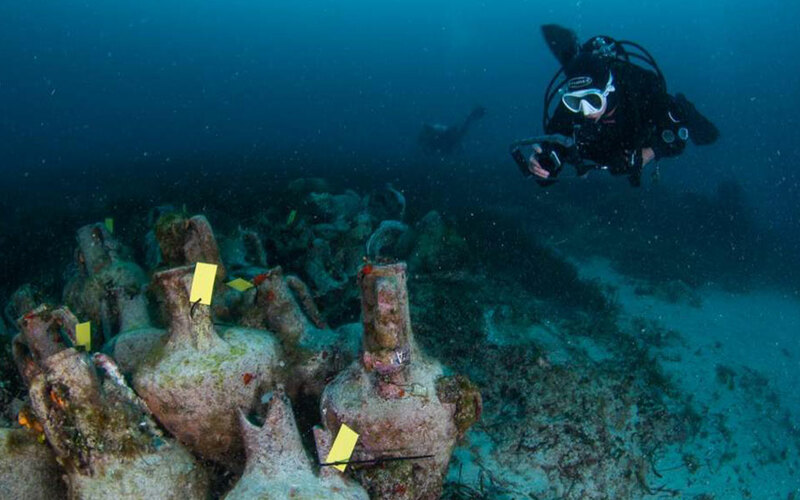 At a two-day event in Alonissos over the weekend, the Culture Ministry unveiled the pilot phase of the program, which entails allowing scuba divers to explore the Peristera site, which is overseen by the Ephorate of Underwater Antiquities.